Now entering our fifth year, the work of the Upper Deeside Access Trust continues apace across the mountains and glens of this remarkable area, and I am pleased to provide NEMT readers with a brief update on our main activities over the past year. As ever, a key area is our ongoing programme of mountain path restoration. We completed substantial repairs to key sections of the Glas Allt path on Lochnagar, and improved the approach path to the Dubh Loch above Loch Muick as far as the Stulan Burn. We also completed similar work to the Choire Chash path between the head of Loch Muick and the plateau, and realigned the popular path to the summit of Creag Choinnich above Braemar. All of this work has been carried out sensitively and to a high standard by experienced path contractors, and I would encourage NEMT members to go and see the results for themselves. In parallel to this, we also held a pioneering workshop to develop some consensus on our future priorities for path management in the area. Users were presented with the findings of a major condition survey undertaken by UDAT of the most popular and damaged mountain paths in the area and debated future needs. Recommendations from this event have helped shape a carefully balanced programme for the coming years ahead. Our other main strand of work was carried forward with the creation, development and signage of low ground paths and tracks around Braemar, Ballater and the Muir of Dinnet/Loch Kinord NNR. This included upgrading, to an all abilities standard, two popular paths that run to the Burn O' Vat, and creating a new 1500 metre path running parallel to the burn, rising up through a beautiful pinewood to join the Cambus O' May track. Oak signposting, way marking and information map boards have been installed to help visitors find their way around the various paths and cycle routes. An exhibition panel promoting the walks has been installed in the new TIC in Ballater, and this along with a colourful walks leaflet has proved to be very popular. 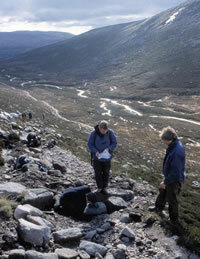 The year also saw the completion of improvements at the Spittal of Glen Muick. The formation of the coach park, landscaping and redesign of the car park have bedded in very well, and traffic congestion, particularly in relation to the movement of coaches and off-road parking has been considerably improved. The charging policy has proven to be broadly accepted by the vast majority of users, and has raised over £28,000 in its first year which will go directly towards our path repair programme. We are currently developing a UDAT website which will feature maps, photos, text and links explaining about the many recreation opportunities and related visitor facilities in the area, as well as providing advice on low impact and responsible use. The site will be linked to the main national and regional tourist websites as well as with prominent tourism businesses. With significantly increased access to the Internet we believe this will become a key tool for visitors, particularly for those seeking information at a distance. It is hoped the site will go live this autumn. Various research was also undertaken through the year to inform our work including a visitor survey on visitor use of low ground facilities and a separate strategic study of year round visitor use at key access points in Upper Deeside. Following a consultation with relevant local interests we have recently expanded our area eastwards to include the Howe of Cromar and Aboyne. There is considerable potential for improving access amongst the very attractive river, forest and hill scenery in both these areas, and we have begun working with the host communities to develop two new local path networks. A new three-year Business Plan covering the period 2002-04 guides our current priorities and we are at the preparatory stages of seeking new funds under the recently adopted EU Objective 2 programme and the Heritage Lottery Fund. These two new sources of funds will be essential in underpinning our work if we wish to maintain the same momentum in future years. We are once again indebted to all our funding partners for their considerable support as well as the loyal support of our Affiliate Members who have provided a valuable sounding board on a range of issues throughout the year.